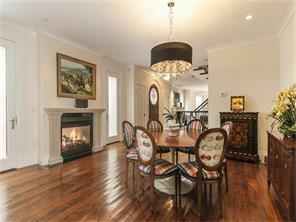 Stunning San Francisco Chic townhome in prime location to enjoy the heart of Cherry Creek . Light filled southern exposure with beautiful French doors opening to inviting private terraces on every level. Elevator with full glass windows and indoor/outdoor fireplace. Extraordinary quality throughout this open flow floor plan with gorgeous woodwork and floors, Exquisite Kitchen Design chefs kitchen with carerra marble,Wolf, Asko, Glass door SubZero and butlers pantry. Elegant master suite with fireplace, his and hers bathrooms, spacious custom closets and terrace. Lower level has huge windows, wet bar, recreation area and bonus room/ non-conforming 4th bedroom and bath with steam. Car lift for 3rd car. This is the perfect Cherry Creek home on a quiet block yet, just a few steps from Whole Foods, Starbucks, fabulous restaurants and shops! Owner is a licensced agent.